Between all of the major life changes that I have experienced over the last 10 years, my Facebook account has remained somewhat of a constant. Looking through my first social media page is like finding a time capsule. It saw me through the awkward early high school years straight through until today. I still log in daily to catch up on the news, see what my family in Tennessee is up to, and to wish a happy birthday to somebody I haven’t seen in years. Like me, more than 25 percent of the world's population is logging in every month. They too have friends to catch up with, statuses to update, and photos to scroll through. Facebook social media marketing is not only cost-effective, but it helps marketers achieve maximum visibility. In this ultimate guide, we’ll show you how to maximize your Facebook marketing strategy in 2018, including: its efficacy, key features, best practices, and some hugely successful Facebook marketing campaigns of the past. Ready to become an expert on all things Facebook marketing? Here's what you'll learn, so feel free to skip ahead to the section you're looking for! Before we dive into all things Facebook marketing, let's give you some much needed background. What is Facebook, and how exactly did it get so popular? We’ll start with a quick refresher on what Facebook is and how it got started. Facebook was established in 2004 by the famously controversial Mark Zuckerberg. Zuckerberg, who still serves as the social network’s CEO, created the site in his college dorm room at Harvard to be used exclusively by the college’s students. The site, which was well-received among the student population, flourished in the first years of its existence. Relatively quickly, Zuckerberg expanded access to other universities in Boston, then to other Ivy League schools, and by 2005, anybody with an .edu email address could create a Facebook profile. In 2006, the website expanded yet again. This time, beyond the realm of educational institutions. Anybody 13 and older with a registered email address could sign up, free of charge. Today, it’s still free to join Facebook, as the company continues to make a profit through advertisements. The social network, while regularly adding new features, still boasts the same key functionalities as it has for more than 10 years now. Once registered for a profile, users can send and receive friend requests to and from people they know (or, sometimes, people they don’t), and maintain their list of virtual friends. They can post status updates, where they’re offered a wide-range of emotions to select how they’re feeling, and comment on or react to the statuses of their friends. Users can also upload and maintain photo albums (my first album was appropriately labeled “spring break 2009!” – it documented my family’s trip to Disney World). And of course, as social networks do, Facebook enables users to communicate with their friends in various ways. They can write a post directly on a friend’s wall or communicate in private using Facebook messenger, a one-to-one communication tool released in 2011. Additionally, users can join Facebook groups or like Facebook pages, which are commonly used as profiles for brands, organizations, and nonprofits. By liking their pages, users will receive the brands’ updates in their feed. These fan pages are an excellent vehicle for Facebook marketing and where Facebook marketers often spend the majority of their time. In 2018, having a Facebook account is nearly as commonplace as having an email address. Users from all over the world log in every day to check out the news, watch videos, and interact with others. Related: If you created an account in the early days of the social network's rise to popularity and feel your username no longer represents you well, it's easy to change your Facebook username. In fact, Facebook has become so popular that members can use their accounts to log in to third-party websites. Household names like Spotify and Poshmark allow visitors to simply link their Facebook account, which lets them log in easily and find other Facebook friends also using the website. Those are just a few of Facebook’s countless innovations over the last 14 years. While it may be considered one of the most “old-school” forms of social media (is that a contradiction? ), it’s not just for political arguments or that uncle with a tendency to overshare. Facebook does an excellent job of keeping itself relevant, not just through new tech, but through its various acquisitions over the years. Most notably, its acquisition of WhatsApp and Instagram – two apps adored by millennials. It’s safe to say Facebook isn’t going anywhere. If you’re a marketer, your audience is there already. While social media marketing isn’t as new and shiny as it was, say, five years ago, those who embrace it are still considered early adopters. In the next section, we’ll answer some burning questions. Why should you use Facebook marketing? And more importantly, is it going to work? Now that we’ve gone over what Facebook is, we’ll dig into what this guide is really about. In this section, we’ll dive into all things Facebook marketing. There are a lot of social networks to choose from. Is Facebook the one that will bring your team success? Facebook marketing can bring you maximum visibility for minimum cost. Behind only Google and YouTube (a Google-owned company), Facebook is the third most visited site on the web, according to Alexa.com. The population of the site itself is massive. More importantly, it’s completely free to start a Facebook page for your brand or organization. Once you build your Facebook page, you can utilize Facebook’s various features to begin reaching your audience. A relatively new Facebook feature that has taken the marketing world by storm is Facebook Live. In 2016, marketers jumped at the opportunity to learn how to go live on Facebook, excited about social network’s response to competing services like YouTube, Vimeo, and even Snapchat. Facebook Live lets marketers stream real-time video to their followers and interact with viewers in real time. This method is not just fun and new, it’s also incredibly engaging. Marketers learned long ago that people love videos because they’re easier to digest than text and, often, more intriguing than a simple visual. As it turns out, people love live videos even more. Viewers will watch a Facebook Live video for three-times longer than they watch a video that is no longer live (but was at one point). If that doesn’t convince you, Facebook’s product team has even made updates to the News Feed that makes Facebook Live videos more likely to appear higher up in a user’s feed, compared to videos that are no longer live. Facebook Live isn’t the only innovation that has excited marketers, though. Ask anybody in the tech world about the biggest trends and latest innovations, and it’s likely that artificial intelligence and chatbots will come up in conversation. Facebook has jumped on that trend with bots on Facebook Messenger. Facebook chatbot messenger, which launched in 2011, is a tool for users to communicate with one another directly and privately. The tool sees more than one billion active users as of 2016 – we can only imagine how much this number has grown over the past two years. Many businesses already use chatbots to communicate with their customers. Additionally, brands typically have a member of their marketing team fielding the questions and comments they receive from users on their various social media profiles. Facebook now enables marketers to use chatbots in Facebook messenger. These bots can help build customer relationships through conversation when a human associate isn’t readily available. This feature is a unique opportunity offered by Facebook. Additionally, it’s early enough in the feature’s life that your marketing team could still become an early adopter. Experimenting with the tool and learning best practices could not only help to engage your customers, but push your team members out of their comfort zones and continue to develop their social media skills. Facebook has also recently released two exciting new photo features – Facebook 3D photos and, the newly announced Facebook 360 photo. In a bit, we’ll discuss the most common methods of Facebook marketing. At that point, we’ll explain how Facebook enables marketers to hyper-target their audience so that their messages are getting to all the right people. For now, we’ll talk a little more about why we use Facebook. When you think of social networks, what do you think of? More than likely, it’s the usual suspects popping into your head. You know, Facebook, Twitter, Instagram, and LinkedIn. Maybe Pinterest if you’re an aspiring-crafter like myself. In reality, there are dozens of social networking sites, each offering unique challenges and opportunities to marketers. With so many choices, why Facebook? If it’s the most popular, isn’t that where you’d also find the most competition? Yes and no. It’s true that Facebook has a massive user group. As of 2016, more than three million businesses actively advertise on Facebook , but that doesn’t necessarily mean those brands are your competition. Think of Facebook’s audience simply as a smaller population of the world. The user group spans from all over the world. Members come from different countries and backgrounds, speak different languages, and, overall, have different needs. Facebook marketing is like general marketing. By that, we mean it’s all about finding your audience. This, of course, brings us to our next question. Is Facebook marketing going to work for me? Ultimately, your success depends on your goals. That said, Facebook offers a plethora of opportunities for marketers, and your audience, no matter their age, gender, or location. If I’m going to tell you that your audience is on Facebook, I should probably have the statistics to back that claim up, right? Before we continue to discuss the different types of marketing opportunities on Facebook, we’ll take a quick break to look at the people who use it most. 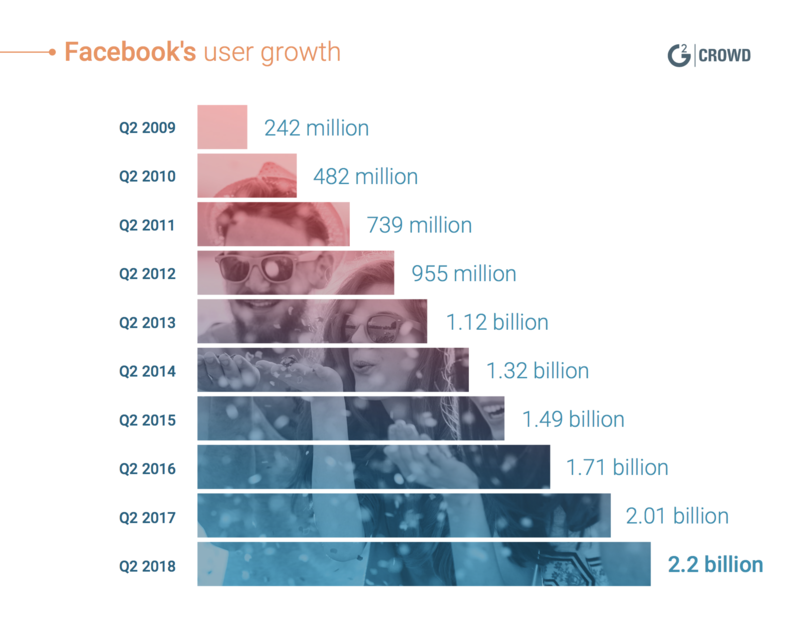 As of March 31, 2018, Facebook sees 2.2 billion active users. This makes it by far the most populated social networking website, with YouTube coming in second at 1.3 billion active users. Those users include people from all over the world and of all ages. The U.S. makes up only 12 percent of users. That may not sound like many, but that’s still a whopping 276 million users. In fact, over two-thirds of U.S. adults (68 percent) say they’re Facebook users. Of that number, 75 percent check in on a daily basis. Your audience is out there. Unless you’re marketing a product to toddlers (which, let’s be real, you’re actually marketing to their parents anyway), I would say pretty confidently to give Facebook a try. While Facebook is regularly announcing new tools and features, there are a few tried and true methods marketers continue to return too. In this section, we’ll discuss the unique and beneficial features of Facebook Pages, Facebook Ads, and Facebook Groups. What each tool requires from a marketer varies. While Facebook Groups are free but time-consuming, Facebook Ads are user-friendly but can get expensive. Determining the tool that will best suit your needs depends on which resources you are willing to commit, whether that’s time, effort, money, or a combination of the three. If you have a Facebook, think of your profile. How do you use it? Do you post status updates and images? Do you share links to content that you think your friends (both real and virtual) may enjoy? A Facebook business page is like a Facebook Profile for companies. It’s totally free to set up and very simple to use. Because of that, it’s the easiest and most common way to get started with a Facebook marketing strategy. Instead of sending or receiving friend requests, Facebook users simply like the pages of the organizations that they want to follow. Once they like a page, those brands’ updates will automatically appear in their feed, and is a great way to build a customer base. This differs from typical Facebook friendships in a few ways. Anybody can like a Facebook page, meaning brands aren’t required to accept fans and there isn’t any delay in growing your audience. If somebody likes your page, they’ll begin to see your updates immediately. Additionally, there’s no restriction on fans or followers. Whereas typical Facebook profiles are limited to 5,000 friends, Facebook Pages are allowed as many fans as they can acquire! When you’re building your organization’s Facebook Page, there are a few things to keep in mind. You’ll be required to select a profile photo and a cover image. The profile photo should always be your logo, no matter what. Because this is the image that shows up next to every update you post, the use of your logo will increase visibility and ensure your audience associates the relevant content you post with your brand. That said, we do understand the desire to get creative. While your profile photo isn’t the place to do that, there are still plenty of opportunities to come. You’ll also have to upload a cover photo. This is the larger photo that sits at the top of your profile and stretches across the page. Like your profile picture, it is public and anybody who comes to your account will see it. Your cover photo provides an excellent opportunity to show off your brand’s fun side. You can use a picture of your employees, an image of your product in a new light, or your most recent advertisement. This banner takes up nearly a quarter of your page, so it's essential you choose an image with the correct Facebook cover photo size. The optimal size for a cover photo is 851 pixels wide and 315 pixels tall for desktop, 640 pixels wide by 360 pixels tall for mobile. If the photo is too large, you’ll have to cut some of it out. On the other hand, if it’s too small, Facebook will stretch the photo making it blurry and visually displeasing. 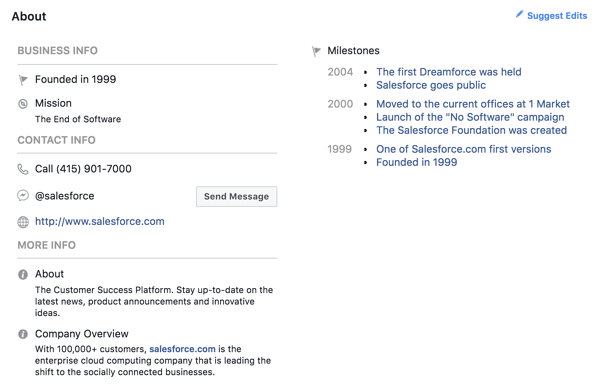 Facebook allows personal accounts to use a Facebook 360 photo as a cover image, but not business pages. Another basic feature of a Facebook Page is the About section. When a user visits your page, they’ll immediately see your feed (the images, statuses, and videos you post), as well as your profile picture and cover photo. Using the navigation sidebar that sits below your profile picture, they can click through to your about section. In this written section, you’ll want to provide an informative, but concise, blurb about what your company is, who you serve, and why you’re different from your competitors. If you’re in a crunch, you can copy the information from your organization’s own website, but I recommend taking the time to tailor this message specifically to your Facebook audience. Social media is fun. Social media marketing shouldn’t be any different! The tone of your About section can be more informal or friendly than what you would usually post. Just don’t go overboard. Work with your team to find the right balance so you can create something that will simultaneously describe your offering and appeal to your Facebook fans. Now that you’ve built out your profile a bit, you’ve gotten to the fun part – actually posting content for your audience to see! Posting regularly is what keeps your audience engaged. Nobody likes to follow a brand that only shares a promotional image or quick status update every other month. Instead, you’ll want to post on a regular schedule and offer content that provides value to your audience. Now, the question becomes what do you post? The answer is simple – just about anything! If you recently published a well-performing blog, posting it to your Facebook page is a simple way to enhance its reach even further. As long as it’s relevant to your Facebook audience, you can absolutely post your brand’s blog posts and articles. That said, you don’t want to be overly promotional. If you only post your own content or post the same blog article six days in a row, your followers will notice (and probably get a little bored, too). You can break up these posts by sharing industry news (but not from your competitors) and articles from outside sources that mention your organization. While these posts provide value, they also send the message (or reinforce the idea) that you’re posting with your audience in mind – not just to sell your product or service. Facebook can also be an excellent medium on which to show off your culture, provide a bit of insight into employee life, and for customer acquisition. In general, social media is informal. Posting a fun video, like this G2 Crowd video that asks our employees which co-founder is their favorite, humanizes your brand in the eyes of your audience. And don’t forget about a key feature of social media – engaging with your audience. Post questions for your audience. Ask them about their favorite product of yours or to post a photo of them visiting your restaurant. Consumers, especially millennials, are growing exceedingly loyal to their favorite brands. Giving them the opportunity to engage, and then engaging right back, will build a relationship and earn their loyalty, a key to how to sell on Facebook. The best part about everything we listed above? It’s free! Not to mention, relatively simple. That said, if you have financial resources to commit, you can see even more results. In the next section, we’ll discuss Facebook Ads and how they can help to grow your brand’s online presence. Remember that if you ever feel as though you or your company's information is being compromised, the best course of action is to change your Facebook password. For help on figuring out how to do so, head to our article on how to change your Facebook password in a few easy steps. If you have a Facebook profile, you’re no stranger to the amount of personal information you’ve coughed up over the years. Name? Check. Age? Check. Location? Check. Relationship status? Well… it’s complicated. Granted, we’re not required to submit this information, but that’s never stopped me! The majority of users I’ve seen have shown little restraint in forking over their details. While this mass quantity of information has certainly made way for some security concerns over the years (and totally freaked out my mom when I was a 14-year-old with a Facebook), it also means Facebook has a crazy-unique opportunity. Due to all of the demographic information it has collected, it has a top-notch targeted advertising platform. Facebook ads are paid messages from businesses that can reach their ideal audience through Facebook's hyper-targeting. Because the ad content is created by your individual brand, it will be written in your voice and appear naturally in your audience’s newsfeed. You can target your audience based on any information that may be public on their profile. That’s right – you can target by the basics, like age, location, and education level, or you can dig even deeper by targeting individuals based on life events (like a recent move), interests (a restaurant group may target individuals who have liked the page of a similar restaurant), or relationship status! Depending on your goal, you can personalize each Facebook Ad with a different call-to-action (or the action you’d like your audience to take). You can direct an ad to your organization's Facebook Page or website. You can even create ads for a specific event and include an RSVP link. This is an especially cool opportunity if you’re promoting a professional conference, grand opening, or fundraiser. While this is certainly the pricier option, you’re in control of how much you spend. Facebook uses an auction system, so you determine how much money you’re willing to bid to have your advertisement shown to your target audience. These bids are based on the cost per click or cost per impression on your ad. Once you set your budget per campaign, Facebook will never go over. Not only do Facebook ads offer a relatively simple and cost-effective way to reach the people who matter most, they also can be insightful as to the content that is working or isn’t working and why. When a Facebook user is shown an ad, they have the option to close it out if they don’t like it. If they choose to close the ad, Facebook will ask them to select a reason for doing so from a short list. Their answers will be available to you, the advertiser, which is valuable information you can use to improve your content for next time. While they may not be free, these ads can still prove to be helpful (and cost-effective) for marketers. Additionally, Facebook Analytics can be insightful when analyzing your Facebook performance and its efficacy. If you’re looking to achieve high traffic to a certain web page, increase RSVPs to a particular event, or spread the word about a new product or service you’re offering, a Facebook Ad campaign can be an excellent method to implement. Facebook values community. One benefit of being surrounded by a community is that you can use them to crowdsource thoughts and opinions. To emulate this real-life habit we have of going to friends and family for advice, Facebook allows its users to create polls. Polls can only be created within groups and by page administrators. For this reason, it's more of a marketing tool than a personal feature. Polls can be used to ask your network anything, be it their favorite holiday, to what they think your new brand should be called. Facebook polls are created within the Facebook platform, and are fairly easy to make. You simply navigate to the page you're hoping to post the poll from and choose to post a poll in the same way you'd choose to post a photo or a status. If you need more information, navigate over to How to Create a Poll on Facebook (With Examples!) for step-by-step instructions. A Facebook Group is a place for users to connect and communicate over shared interests. 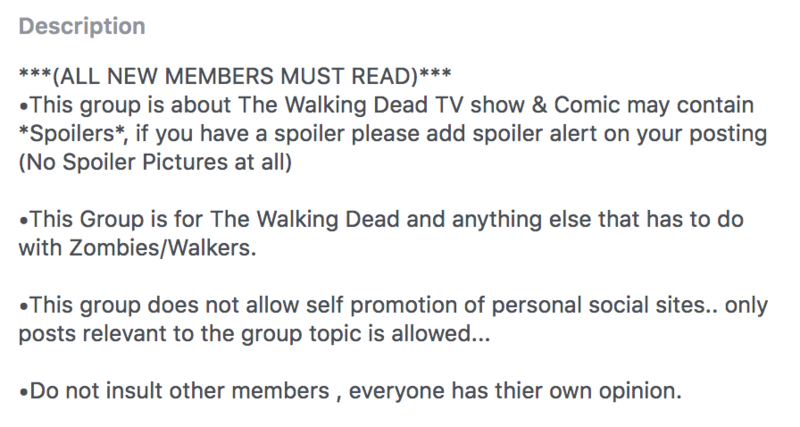 These groups can be private, like the group my extended family uses to plan reunions and talk about Thanksgiving dinner, or public, like this group devoted to the fan-favorite TV show, The Walking Dead. Prior to 2017, brands typically opted for the aforementioned Facebook Page, which allows them to control the narrative a bit more. That changed in July of 2017 when Facebook launched a marketer’s new secret weapon, Groups for Pages. These are official groups linked to a brand’s page where fans can communicate with one another, providing a deep level of engagement and genuine interactions. These groups, which are similar to LinkedIn groups, can consume massive amounts of your time, but they’re a free way to reach and build relationships with your biggest fans. To best utilize Facebook groups, you’ll want to be sure you provide users with guidelines. You don’t need to tell them exactly what they can and cannot post, but you’re going to want to offer some general rules about what is and isn’t acceptable. By no means are we suggesting that you discourage all negative feedback – in fact, there are tons of positives to negative reviews. Providing guidelines is simply a way to ensure your group remains a productive place of communication and not a hostile environment filled with the dreaded social media trolls. To ensure the group is valuable, consider writing and posting various discussion questions throughout the week. For example, say your exercise equipment brand recently released a new resistance band. Ask the group how they’ve been using it, how they’ve liked it, and to share some exercise ideas with the community. Suddenly, you’ve started a high-energy discussion that will stir up some excitement around your latest offering. Facebook groups are time-consuming, yes. Not only will you have to offer up opportunities for engagement, but you’ll also have to moderate users and their posts to ensure there isn’t any inappropriate content. However, if you have the time, they can be a cheap (as in, entirely free) way to encourage engagement within your customer group and build a community. We’ve said it before, and we’ll say it again; when it comes to social media marketing, you can’t go in without a strategy. Sure, social media is more informal. Brands can adopt a more casual, friendly tone and truly build relationships with their customers. That said, marketers aren’t using social media in the same way that we, as consumers, do. As consumers, we have the freedom to log in to Facebook and post a status update about whatever we’re thinking about at that moment (many, many people abuse this privilege, but that’s a story for a different time). Marketers, on the other hand, don’t have that freedom. To successfully implement a Facebook marketing strategy, you’ll need to plan ahead. In this section, we’ll cover the steps to take before sharing a single status. Luckily, this first step is easy. First, take your normal target audience (if you need help determining that, we’ve covered it in our ultimate guide to marketing). Now, look at Facebook’s demographics. Do you see where the two markets overlap? Boom. You have found your Facebook audience. Under the assumption you’ve already created your Facebook page (if not, check out our how-to guide), you’ll now determine the type of content you want to distribute. No matter what, it should be compelling, entertaining, or educational. Ideally, it will be all three! When determining the content type, it’s not likely you’ll select only one. Marketers and consumers alike typically opt for a combination of the following. Your first option is a Facebook status. Statuses, which are simple text updates (although they don’t have a 240-character limit like Tweets), can be great for quick updates. While they haven’t always been visually compelling, new features like larger text and the ability to put text on a colored background certainly draw the reader in a bit more. The next option is images. While I’m a firm believer that an image should accompany almost every status, I wouldn’t recommend posting visuals just for the sake of posting them. On any social media platform, you should put effort into posting high-quality and aesthetically pleasing photos. And don’t forget, images can make even the most boring of products exciting. Don’t believe me? There's even a shipping cargo company with more than 1 million Facebook fans. Visual elements on Facebook pages can look many different ways, but one of the more popular, newer ways to showcase visual content on Facebook is through Facebook 360 photos, which are a sort of panoramic photo that takes the viewer into the image in a new, immersive way. Your final option is my personal favorite: videos. Facebook is rated as the most impactful social channel for video, so what are you waiting for? They’re entertaining and super easy-to-digest. Similar to other visuals, don’t post just to post. Put time into the videos you’re posting if you want to see results. Remember, these three should all work together. Every video you post should include a description (sometimes, in the form of a status), and a Facebook status should come with a visual, and so on. Don’t forget to include relevant links, too, and use Facebook Live when appropriate. Once you’ve determined the type of content you want to post, create your calendar! This can be tentative, but having a general idea of when you’ll post what will give your team plenty of time to prepare and make sure you’re not overloading your audience with a certain type of content at any given time. As I said, marketers shouldn’t post in the same way as consumers. Frankly, this practice is more likely to result in mundane images, typos, or the dreaded employee status that was supposed to go to their personal account. Scheduling posts in advance allows you to put more effort into quality. The more relevant and engaging your posts are, the more likely your audience is to keep coming back. Consider using a social media marketing software tool that will allow you to see weeks, and even months, ahead and manage all of your social media platforms from one place. 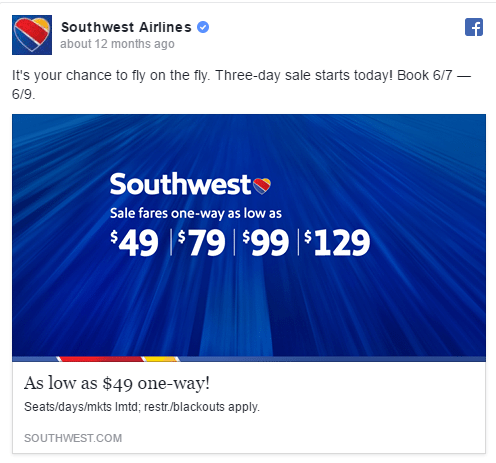 Now that we’ve set you up for success, we’ll show you some brands who have implemented some stellar Facebook marketing campaigns. If you’re looking for inspiration, you’ll find it here! Some social media marketers just really get it. In those cases, a single Facebook marketing campaign can go viral, gain a brand tens of thousands of fans, and be remembered for years. In this section, we’ll discuss some of the best Facebook marketing campaigns from the last 10 years. The following initiatives are the types of marketing campaigns that are loved by consumers and envied by competitors. In 2014, Always set out to show how the meaning of “like a girl” becomes more negative as we get older. As little girls, the concept of doing things “like a girl” doesn’t hold much weight. However, through puberty and beyond, being a girl is often associated with being weak and emotional (among many worse stereotypes). Through this campaign, Always ventured out to change the meaning of “like a girl,” by asking girls of all ages to run like a girl, throw like a girl, and more, and see how they acted. What they found was that little girls ran fast and threw fiercely and older women would run daintily and express the fear of ruining their hair. The video stressed the importance of teaching women of all ages that “like a girl” shouldn’t come with a negative connotation. The video was an instant hit that acquired more than 200,000 Facebook likes and 55,000 shares. Due to its success, #LikeAGirl has become a critical aspect of Always’ messaging, even four years after its initial release. If you’ve watched basic cable in the last month, you’ve probably seen an Allstate commercial featuring its character, Mayhem. Mayhem, always played by the same actor, comes in many forms, all of which cause some sort of destruction to a home or car. Upon seeing the success of these television commercials, Allstate made an unconventional move by making Mayhem his very own Facebook page. The move paid off, as Mayhem quickly amassed Allstate in Facebook fans. Today, he has a staggering 1.8 million. The posts are humorous, relatable, and see tons of engagement. It may not have been the most traditional method of Facebook marketing, but Allstate showed that posts about unmet New Year’s resolutions and wedding nerves really resonate with people (imagine that!). My personal favorite Facebook marketing campaign was a video that Kraft released. This video showed A1 Steak Sauce changing its Facebook relationship status with steak to “it’s complicated.” The video, which aimed to promote A1’s new line of sauces, went viral with more than 1.3 million views. In addition to being plain-old funny, the creative film used Facebook-specific features like photo albums and the “it’s complicated” relationship status. This video clearly required a lot of effort in both planning and execution. However, it shows how well-thought-out content can pay off. And as for A1 and steak’s relationship? Well, I’ll let you see how it turned out for yourself. Have you seen any standout Facebook marketing campaigns recently? Tweet it to me at @Claire_Brenner so I can see for myself! I invite you to bookmark this page and refer back to it, or share it with your network!